Looking back at old photos can make you notice distinct differences in the shape, plumpness, and smoothness of your face and skin. As we age, facial bones change shape, fat and tissue is lost within the face, resulting in the development of wrinkles. In addition to the natural ageing process, changes in hormones, and certain life style habits contribute to changes in your facial appearance. Some of lifestyle habits can accelerate the ageing process and this can have negative impacts on a persons self-image and self-esteem. Learn more about what happens to the face as you age, the most common problems we see and what you can do to maintain a youthful appearance. 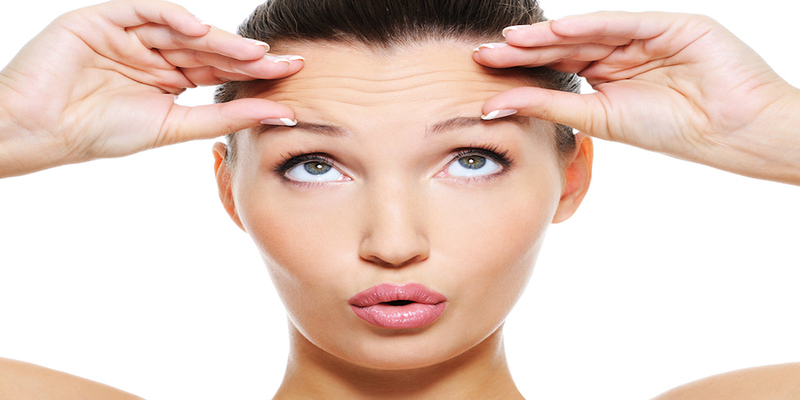 Forehead wrinkles and frown lines are horizontal lines that develop above the eyebrows at the top of the face. They are developed through repetitive facial expressions, and with the natural ageing process and environmental factors such as UV exposure and smoking they are accelerated. Forehead wrinkles and frown lines can make a person look tired, aged and leaving the person to feel self-conscious. This problem area is a common concern for most clients and the thought of injecting wrinkle relaxing toxins into the body is a step to far for most. However, there is a non-invasive and non-surgical treatment for forehead wrinkles and frown lines. The treatment uses the body natural healing process to reduce and remove wrinkles, resulting in a more youthful appearance without the use of any toxins or anti-wrinkle injections. RT Aesthetics offer Fibroblast Plasma Lift, that is a natural, non-invasive and non-surgical treatments to improve the appearance of forehead wrinkles and frown lines. Fibroblast Plasma Lift reduces frown lines and forehead wrinkles without anti-wrinkle injections. Fibroblast Plasma Lift is a highly effective treatment for reducing the appearance of wrinkles and lines by using Plasma energy. Fibroblast Plasma Lift increases skin elasticity and the production of collagen, whilst reducing skin pigmentation and oil secretion. Fibroblast Plasma Lift uses plasma energy to treat excess skin tissue in the eye area such as hooded eyelids and eye bags. Fibroblast Plasma Lift is non-surgical and non-invasive treatment that removes excess skin in other areas, such as erasing crows feet, reduction and removing laughter lines and helping to treat forehead lines and wrinkles. After the Fibroblast Plasma treatment the body produces new collagen and remodels existing collagen, refreshing the eye and helping to reduce and remove lines and wrinkles. Our HIFU treatment uses Ultrasound energy which is able to target the deep structural layers of the skin. Through the use of focused ultrasound waves, heat is generated at specific depths, resulting the body healing response been activated. This naturally increases the production of collagen and leads to lifting and tightening of the eye area. HIFU helps to reduce the signs of ageing, for a younger more youthful appearance. Radio Frequency uses radio frequencies waves, that causes heat that causes the production of new collagen in the dermis, this reduces the appearance of fine lines and loose skin around the eye area. As the new collagen is produced, the skin begins to tighten around the eye area and is completely pain free. This treatment can also turn back the years, as 91% of women found that Radio Frequency treatment reduced the appearance of fine lines and wrinkles, giving them an overall more youthful appearance*.